Oh hello there. Yes, I am still alive and I do still occasionally do things other than listen to funk. This is a thing I did. The colour in the photo isn't really accurate -- I twiddled with saturation and such in Photoshop and got it closer to the right shade, but this is still not quite right. I'm quite taken with the actual yarn -- it's a semisolid army green, and it is not weirdly blotchy, either. The pattern is Latoya, an unsigned piece by Norah Gaughan, who is famous among knitters for her interesting designs and cables. I made significant modifications to the pattern, a full description of which are on my Ravelry page for curious knitters. This took me about 4 months to knit, which is not bad for me. 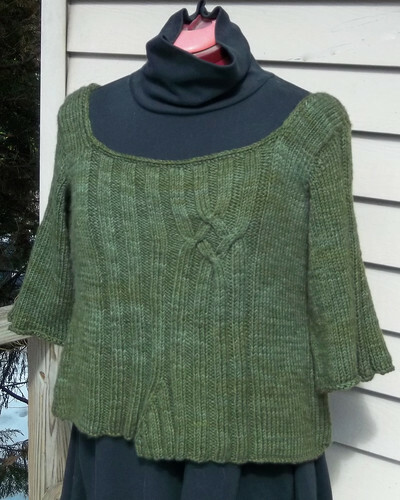 I am especially pleased to have finished it before March or April, so I will be able to wear it a few times before the warm weather gets here.